Tim Cote lives in East Waterloo, Maine. Tim has lots of experience working on cars, motorcycles, atvs and most anything mechanical. Restoration of his 1971 Corvette is his first total restoration project. You can visit Tim's website at www.corvette-restoration.com. On with the engine disassembly! The first task this weekend was to remove the oil pump. 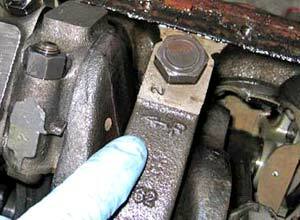 It was a pretty simple task since it's only attached to the engine block with a single bolt. Take off the Corvette water pump. With the oil pump out of the way I moved onto removing the pistons and connecting rods. Before doing any disassembly I first verified that each rod had identification markings on both the rod and the rod cap. Because each rod and cap is a matched set it's important to keep each set together. It's also important that each assembly is reinstalled in it's original cylinder. Because these rods are original from the factory they were already numbered one through eight, in order of front to back of the engine. 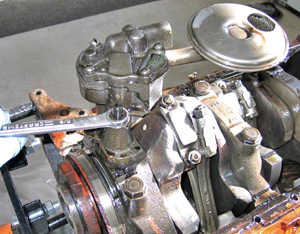 After removing the connecting rod cap I was able to carefully slide the piston out of the cylinder. Notice that I've placed pieces of 3/8" rubber tubing over the connecting rod studs to protect the crankshaft journals. Without this protection the journals could easily be scratched or nicked by the hardened studs. With the piston assemblies out of the way it was time to remove the crankshaft. Similar to the connecting rods, each main bearing cap was already numbered and oriented with an arrow pointing toward the front of the engine. Again, it's extremely important these are replaced in the same order and orientation. If yours aren't marked already, do it yourself! 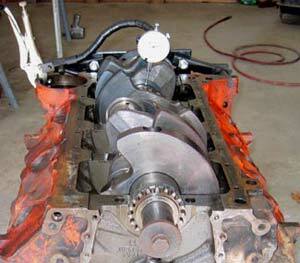 Before removing the crankshaft I first wanted to measure it's end play. To do this I removed the front 4 main bearing caps but left the rear main cap and bearing in place. Unlike the other bearings, the rear bearing (also called the thrust bearing) is flanged and prevents the crank from 'walking' forward or backward. Using a dial indicator I measured the end play at about 0.004". Typically, end play of 0.005" or less is desirable while end play of up to 0.008" is acceptable. In my case, the final endplay will be even less once new bearings are installed - the old ones were slightly worn on the flanges. 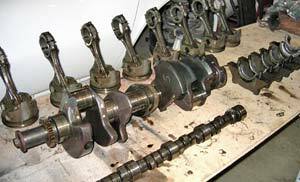 Secondly, I checked the crankshaft runout. To accomplish this I removed the crankshaft, removed all but the front and rear main bearings, and then reinstalled the crankshaft. 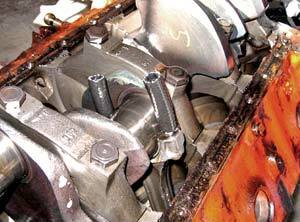 It sounds pretty easy, but removing and installing the 70 pound crankshaft is a chore, especially considering extreme care needs to be taken to prevent damaging the crankshaft journals. Once the crank was reinstalled and supported by only the front and rear bearings I checked each journal with a dial indicator for runout. Thankfully runout was less than 0.001", well within tolerances. 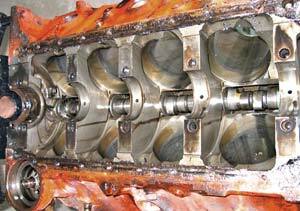 Excessive runout would mean the crankshaft would have to be milled, or possibly replaced. After taking the runout measurements I removed the crankshaft and then laid out the main bearings similar to what I had done with the connecting rod bearings. Note the flanges on the thrust bearing I noted earlier, these flanges are what prevent front-back movement of the crankshaft. 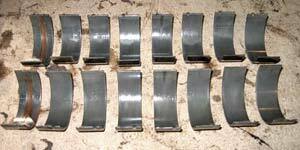 Like the connecting rod bearings the main bearings also showed signs of moderate wear. Needless to say, at this point I'm very glad I decided to do a complete rebuild since it looks like the engine was running on borrowed time! 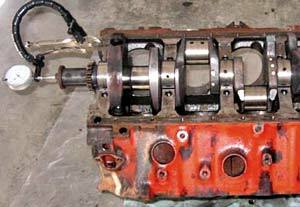 With the crank out of the block the only major component left to be removed was the camshaft. Here the major components of the bottom end have been laid out on my workbench. At this point I'm not sure if I'll be able to reuse the pistons or not. 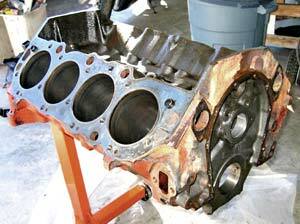 I'll be taking the engine block to a machine shop to be checked out in the next few days. 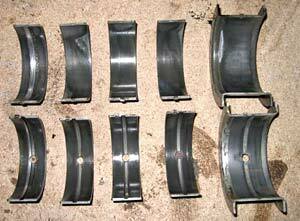 Wear on the cylinders will determine whether they need to be bored out. If boring is necessary new larger pistons will need to be ordered. Here's the fully stripped block ready to head out to the machine shop. Along with the block I'll also have them check out the crankshaft and connecting rods. More on that in the next update! That's all for now, stay tuned for the next update!